We race once a month on a Sunday at Stu Johnson Park, which is located approximately five klms out of town on the Borah Creek Road. The track is a well-maintained 1.2km of rich black soil with plenty of woops, table tops & berms to cater for all classes of motocross. We have added a enduro/grass track section that takes it out to 2.6 kms, which we are able to use on our practice days at this stage. Canteen & toilet facilities are provided with good spectator views available. Sign on is from eight o’clock sharp and racing generally concludes around 4pm followed by the presentation. 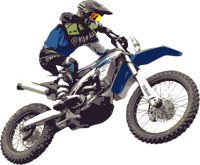 Motocross is a great family sport and the Quirindi Motorcycle Club openly invite all riders to attend our club days, from the experienced to the novice, as our race classes range from five year old nippers to the A grade senior riders. Quad bike riders are welcome (please contact the club beforehand). Club Meetings are held at the Quirindi RSL at 7pm. Dates are put on our Facebook page.